Fly high above OSU and get a bird’s eye view of campus! 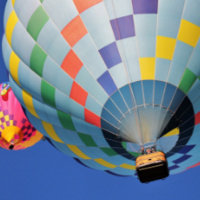 Weather permitting, tethered hot air balloon rides will be offered at a first-come, first-serve basis beginning at 7:00 AM (end time will vary depending on conditions). Rides can accommodate 2-4 passengers, depending on height and weight. Each ride lasts ~5 minutes. Don't miss this unique experience! Pre-registration requested. $10.00 per person, paid at event. Due to the variable nature of this event, no tickets will be sold in advance. Guests will have the opportunity to pre-register. By pre-registering for this event, you will receive email notification if we are able confirm that weather conditions are suitable for flying. Payment ($10.00 per person) will be due in person at the event. Please note that while pre-registration is limited to a certain number of guests, it does not guarantee a ride given the variables of hot air ballooning (height/weight of passengers, weather, etc.). Rides will be offered on a first-come, first-serve basis. For more information or accomodations, please contact the OSU Program Council at osupc@oregonstate.edu.